Luxury Tent are a great option for wedding or outdoor parties, decoration is magnificent and requires all facility which needs under the tents, mostly Luxury Tent can accommodate huge gatherings, and they are come in your affordable price. Special Luxury Tent:- Our Special Luxury Tent is fabricated by expert team. This tent beautiful decorate using multi-color of canvas and stylish hanging lamps. You and your guests are feeling awesome. Our canvas is protect to your guest from cold winds or rains. Planning a function or party that will involve good decoration like strong marquees, assembling process is fast and much more. Our Raj Tents is create gorgeous impression. 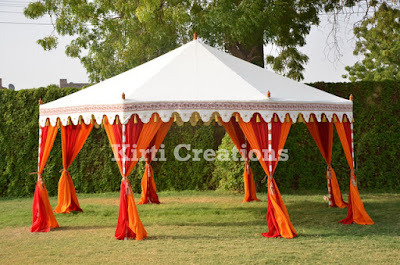 A alluring and tempting designed Raj Tent which perfectly suited to all parties.